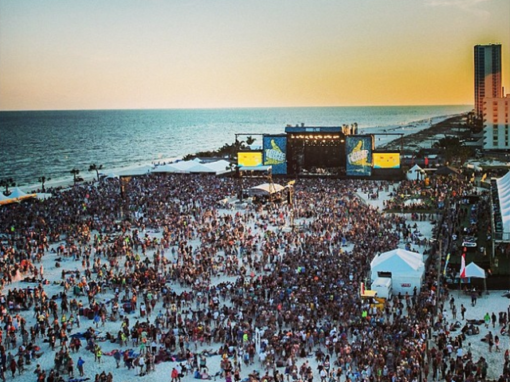 For several years now, I’ve been hearing about this ultimate destination music festival that takes place in Gulf Shores, AL called Hangout Fest. Coachella is corporate LA. Bonaroo is Woodstock redux. ACL is Austin weird. 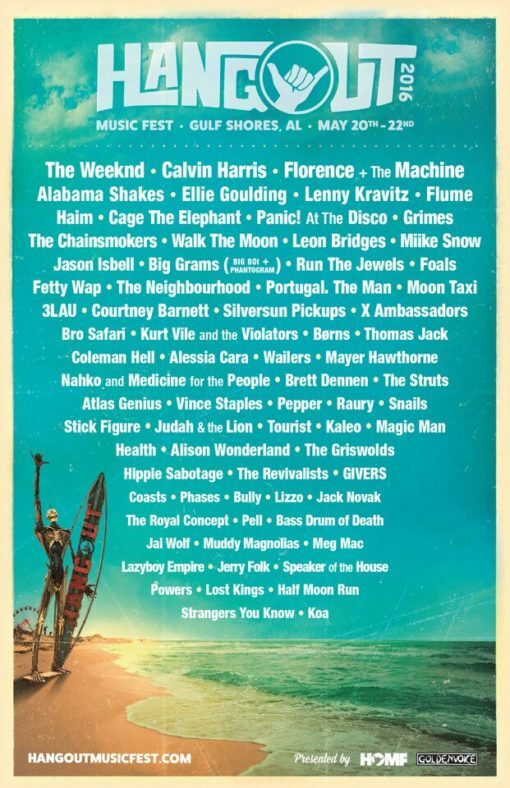 Hangout supposedly has taken all the best portions of every music festival, refined them and placed them in one of the most chill, beautiful locations on earth. Years past definitely had line-ups that were more in line with my listening preferences. 2013 alone featured Tom Petty, The Black Crowes, Stevie Wonder, Govt Mule, Jason Isbell and Shovels & Rope to name a few. A trip through the past few years of showbills will show a line-up that is hard to beat. The opportunity to head to Hangout 2016 presented itself and I jumped at the chance. Line-up sight unseen. Even the worst EDM can be tolerated for a bit with the white sand scenery of Gulf Shores. Originally, I was to be joined by a large group of buddies. One by one they’ve dropped out down to one, The Mayor. We’ll be meeting up and crashing at a condo full of mutual friends and acquaintances. Logistics are still fluid. Everyone already on beach time. Once it was set in stone that I’d be attending, I applied for press credentials on a whim. I was ecstatic when I was approved. I had to pitch my story idea, explain what I wanted to do etc. I made the grade. I’ll be alongside Rolling Stone, Spin, AXS, MTV etc. It’s like being called up from the Durham Bulls or Round Rock Express. Definitely in over my head. There are many great acts on the bill that I’m looking forward to, but chief among them are Jason Isbell, Leon Bridges and Alabama Shakes. I intend to put a GW spin on the whole thing and report back to Texas/OK with funny, revealing dispatches about the festival at large. People watching, music discovering and hopefully a cool interview or two. I’ve yet to arrive and am already super impressed by the way the folks producing this put this party on. They’re organized, professional and have thought of just about everything. I’m excited to go live like Jimmy Buffett and write like Hunter S. Thompson for three days. If there’s an act on the bill you are particularly interested in, drop me a note and I’ll attempt to bring them into the Galleywinter vortex for a moment. I plan to tell the story of the attendees too. I’ve heard that there’s a mix of everything from 18 year olds to 85 year olds. I want to find the oldest person there and see what they think of Florcence+The Machine. I want to see if Calvin Harris brings his girlfriend. I want to corner The Weeknd and ask him if he knows the signs of a stroke. Maybe Killer Mike of Run the Jewels will prophesize on Donald Trump. And above all, I hope to play 20 Questions with Isbell, Leon and Brittany. GW will be in the big leagues for a weekend and I intend to max it out. I love the saltwater and white sands…as much as anyone with Scotch-Irish heritage can. I may be covered in sleeves and lathered in sunscreen, but I’ll be soaking it all up. Stay tuned to our socials! Full recap when I get back and recovered.See you on the beach Hangout! I just want to say I am just beginner to blogs and seriously enjoyed your blog site. Very likely I’m want to bookmark your blog post . You certainly come with impressive article content. Cheers for sharing with us your web page. I’m still learning from you, as I’m making my way to the top as well. I certainly love reading all that is written on your site.Keep the information coming. I loved it! I have been surfing online greater than 3 hours lately, but I never discovered any interesting article like yours. It is beautiful value enough for me. In my view, if all web owners and bloggers made excellent content material as you did, the net will likely be much more useful than ever before. It is truly a nice and useful piece of information. I¡¦m satisfied that you simply shared this useful info with us. Please keep us informed like this. Thanks for sharing. Thank you so much for providing individuals with remarkably terrific opportunity to read critical reviews from this site. It is always so excellent and also packed with a good time for me personally and my office mates to visit your website the equivalent of thrice weekly to read through the newest guidance you have. And lastly, I’m so certainly fulfilled concerning the awesome thoughts you serve. Certain 1 ideas in this posting are in truth the most impressive I’ve ever had. I’m just commenting to let you be aware of what a outstanding encounter my cousin’s daughter enjoyed checking your web page. She even learned such a lot of issues, not to mention what it’s like to possess an awesome giving mood to let the rest completely gain knowledge of a number of complex matters. You actually surpassed readers’ expected results. Thanks for imparting those valuable, trustworthy, educational and unique guidance on this topic to Julie. Thank you for some other wonderful article. The place else could anybody get that type of info in such an ideal approach of writing? I have a presentation subsequent week, and I am at the search for such info.